After watching nb Nobility reverse back onto the facilities through the ice yesterday we rechecked Waiouru’s water tank. We were just over ¾ full, but you never know if the situation will get worse and made a decision to top the tank up in the morning weather permitting. 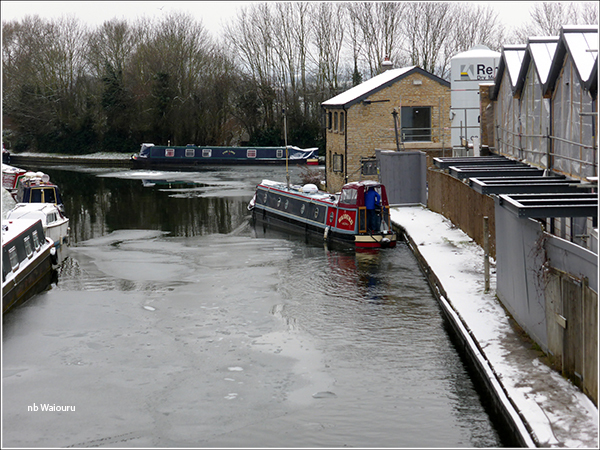 This morning we awoke to find it had snowed overnight and, more importantly, the water in the junction hadn’t refrozen. 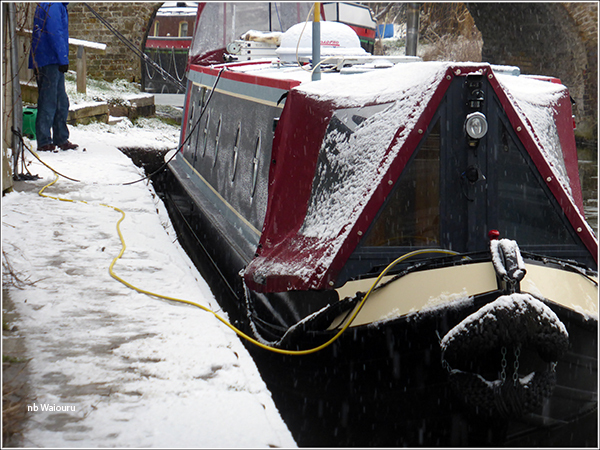 So despite the light snow we decided to fill the water tank by reversing back down to the facilities mooring. Jan walked back whilst I moved Waiouru. But first I grabbed the boat hook just in case I needed to break some ice. Actually everything went well. 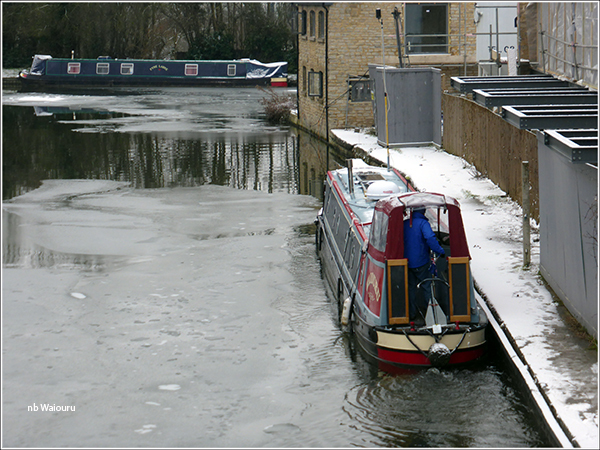 I reversed off the mooring and through some clear water almost as far as the facilities mooring. The ‘grainy’ photo is actually snow! When I reached the solid sheet of ice on the surface I gave a couple of bursts of forward and the resulting wash from the stern broke up the ice. For much of the movement I was able to follow the thin path through the ice that had been created by nb nobility the previous evening. I was quite surprised to find the tap wasn’t frozen. Getting onto the bow to reach the filler point proved slightly treacherous. My foot slipped on the snow and ice covered paint. Then I realised it would be safer to hose down the foredeck and remove the ice. We created the other hazard by walking up and down the concrete path beside Waiouru compacting the snow into slippery ice. Once the tank was full I took the opportunity to hose the snow and ice off the solar panels and sat dome. 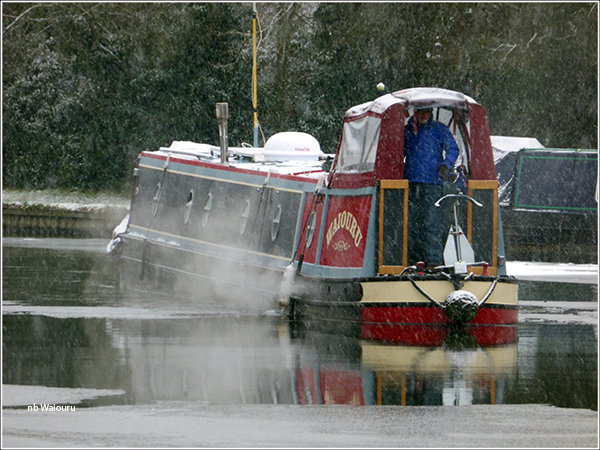 Getting back to our mooring proved to be easier than the ‘going’ Helped by the fact the snow had ceased! In the afternoon I did some paid work (every little helps) whilst Jan baked an apple pie. She didn’t have any old apples which meant our apple pie has tinned peaches in it. Now for the bad news. We had the last of the Braunston sausages for dinner tonight! Time to start looking for another good local butcher.